(Franklin County, Ohio – June 5, 2014) — Dean C. Ringle, P.E., P.S., Franklin County Engineer, announces that improvements of Cosgray Road north of Scioto & Darby Creek Road are set to begin June 9 for approximately 60 days, weather permitting. The improvements will involve the replacement of the existing bridge structure. The posted detour route for southbound motorists will follow Hayden Run Road east to Leppert Road, south to Scioto & Darby Creek Road, and west to Cosgray Road. Northbound motorists will follow the detour route in the opposite direction. Businesses located near the project will remain open during construction. The Franklin County Engineer’s Office will supervise the building of this $884,000 project by Shelly and Sands, Inc. Funding will be provided by the City of Hilliard and Franklin County. For updates or additional information, please call our office at (614) 525-3030 or visit www.franklincountyengineer.org. (Franklin County, Ohio – April 18, 2014) — County Engineers from across the United States gathered together for the National Association of County Engineers (NACE) annual meeting and awards ceremony this week in Baton Rouge, Louisiana. During the meeting, Dean C. Ringle, P.E., P.S., Franklin County Engineer, was named the winner of the 2013 Urban County Engineer of the Year by NACE. The County Engineer of the Year Award is given to one urban (population greater than 100,000) county engineer who has made extraordinary efforts in engineering management principles and standards for the economic design, construction, maintenance and operation of public works facilities. 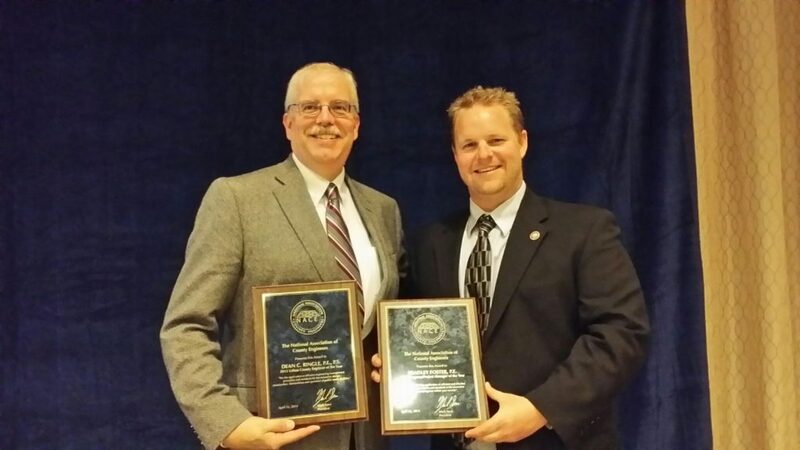 Ringle was nominated to represent the state of Ohio by the County Engineers Association of Ohio (CEAO). Applications were scored based on major achievements, professional accomplishments and outstanding contributions to their communities. Ringle was elected as the Franklin County Engineer in 2000. He leads a workforce of 186 people at the county engineer’s office and is responsible for the maintenance and construction of 271 miles of county roadway and 351 county bridges, as well as the upkeep of storm water facilities within the right-of-way in unincorporated areas of Franklin County. “I am honored to be recognized by my peers from around the country. There were many outstanding candidates for this award and it is a great honor to represent Franklin County and Ohio,” stated Ringle. In addition to Ringle being named the Urban County Engineer of the Year, Bradley Foster, Franklin County Project Engineer, was named the winner of the 2013 Program/Project Manager of the Year, also by NACE. Foster was the project engineer on the Groveport Road at Alum Creek Drive project which was Ohio’s First Flyover Bridge with Double Roundabouts. That project opened in July of 2013. This is the first time that the awards were given to engineers representing the same county and state, in the same year. John Circle was the only other previous Franklin County Engineer to receive the award, in 1995. (Franklin County, Ohio – March 24, 2014) — Dean C. Ringle, P.E., P.S., Franklin County Engineer in partnership with Jackson Township and the City of Grove City announces that the western phase of construction on White Road from Hoover Road to McDowell Road is set to begin March 31 and last until the end of October 2014, weather permitting. Improvements will include new pavement, curb, sidewalks and waterline. The project is broken down into two closure phases totaling 180 days, weather permitting. Traffic will be detoured with local access maintained. The posted detour route for westbound motorists on White Road will follow McDowell Road north to Stringtown Road, west to Hoover Road, south to White Road. Eastbound motorists will follow the same detour in the opposite direction. Motorists should expect increased congestion and delays during construction. Jackson Township will hold the contract, and the Franklin County Engineer’s Office will supervise the building of this $1.9 million improvement by Shelly & Sands, Inc. Funding is through the Ohio Public Works Commission, Jackson Township, the City of Grove City and Franklin County. Please visit the Franklin County Engineer’s website at www.franklincountyengineer.org or Jackson Township’s website at www.jacksontwp.org for updated news and information.